In the last couple days we’ve started looking at life after this challenge. From the beginning we’ve been focusing on building that foundation routine for our daily and weekly tasks, but there is so much more to life and what we need and want to do, than just three things. We talking a little bit about how to use our planner to help keep us on track, and now it’s time to really kick that up a notch. It’s time to start thinking about how to start focusing on more than just the basics, but we need to do with purpose and intention. One of the most effective ways I’ve found to do just that is to create time for a weekly planning session. Yesterday we talked about the importance of setting our priorities and how to go about doing that. We’ve done up a budget for our time to determine if we’re over scheduling ourselves or not. Now we need to focus on pulling it all together. We do this by making time each week to sit down and plan the following week. I do this with a weekly planning session. I know it seems like this is kind of a useless step. I used to think so. I mean, who plans to plan? But when I stopped thinking it was useless and started really seeing it for what it was it suddenly made a whole lot of sense to me. A planning sessions allows you to get a good look at what’s happening in your world for the coming week. 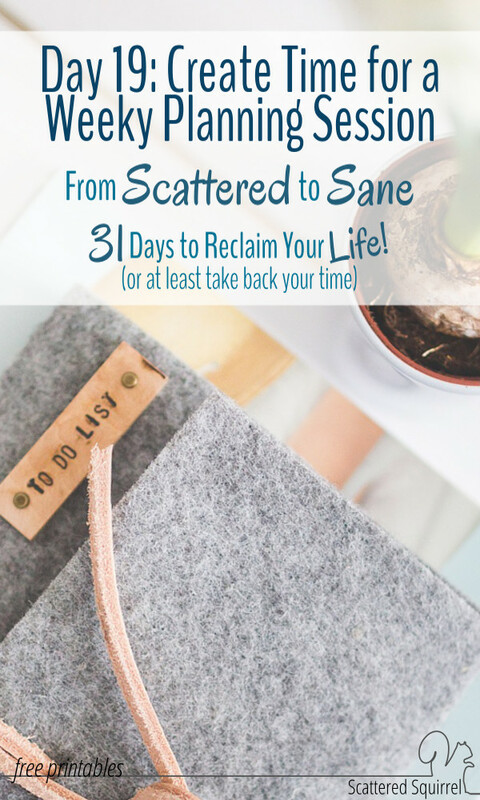 By taking time BEFORE the week starts to sit down and plan it out, you free your mind from the clutter of ‘must-not-forgets’ and that nagging feeling of ‘I-must-be-forgetting-something’. Taking the time to be intentional about how you’re spending your time will give more control over just that, and will go a long way to helping you feeling less scattered. A planning session doesn’t need to take long. I spend about 10-15 minutes on mine. That’s just long enough to enjoy a nice cup of tea while I jot down my plans for the following week. 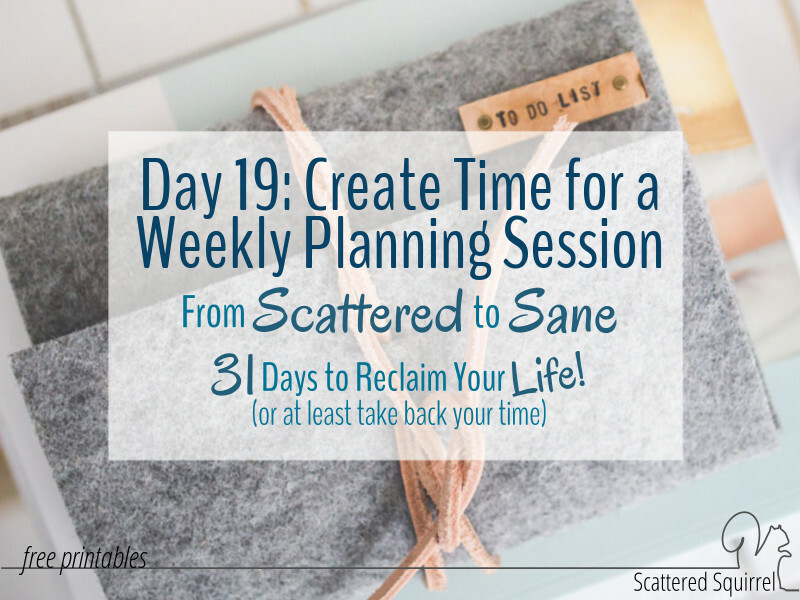 Creating time for you weekly planning session is really easy. Pick a day of the week. For me it’s Sunday. Then determine if you’re going to do this planning session on your own, with your spouse, or with your family as a whole. If you’re doing this on your own or with your spouse set aside a 30 minutes block of time where the kiddos are not allowed to interrupt you. (if you’re doing this on your own, make sure your spouse or partner doesn’t interrupt you either) Once you’re done your planning you’ll probably have some time left over – DON’T put your things away. Take that extra time for you. Just sit and bask in the quiet, or enjoy a cup of your favourite drink without interruption. If you and your spouse are planning together, take that extra time to just enjoy being with one another. Fitting in these little moments is really important, especially when life feels super chaotic. If you’re going to do weekly planning sessions as a family consider making it fun with special snacks or following it up with a game or a movie. Or, if you’d rather, just pick a day and make it a goal to plan the following week before you go to bed that night. The important part is that you make the time to plan your week. If you use a monthly planner or goal sheet, check that and write down anything you need to do this week to support your goals. Do any bills need to be paid? Make sure to leave free time every day. That’s it! That’s all I do for my planning session. I run through that list real quick. The more often you do it the faster it gets because you start to just write the repeat things down without thinking about them. Don’t worry, you don’t have to come back and check this post each week while you’re waiting for it to become second nature. I whipped up a weekly planning session checklist and quick reference printable for those who would like it. Just click the pic below to snag a copy for yourself. Fill in the sections on the right hand side so that when you’re sitting down to plan, that info is right there at your finger tips. Once you’ve filled it in you can fold it half and stick a tab on top to act as a page marker in your planner, or you could just leave it as is. Whatever works for you! Today, take a few minutes to think about when you can set aside time for a weekly planning session. Print the worksheet and fill it out. And most importantly, check back soon because I’ve got some new weekly planner printables coming your way! I’d love to hear from you! Do you already set aside to plan your week in advance? Or do you have a different method for planning? Drop me a line in the comments below and tell me about it! 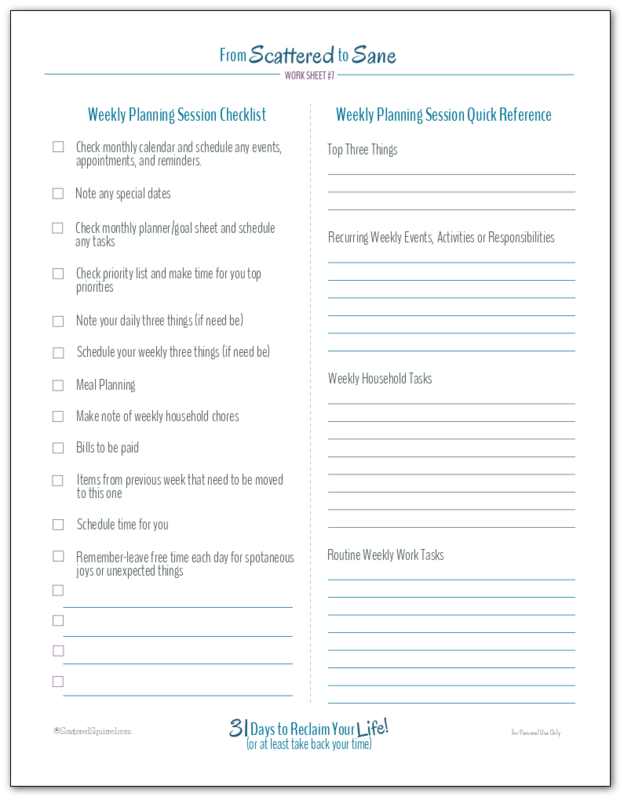 I do plan each week before it starts but your printable makes it so much easier .I will print only once and use it as a guide to how to plan . Hi Lina, oh my – Egypt! I’m dying to go there one day. I’m happy to hear that you like the printable. I have mine in a page protector in the back of my planner and I just pull it out when I need it. Hi Alli! This is so smart! I do a weekly planning/bill paying session, but your guide will help me be more focused during that time. Love it! Hi Katie, oh I’m so happy that you’ll find this useful. I’ve found that having a plan for my planning (there’s a mouthful) has been a tremendous help in keeping me focused and making sure I’m not stretching myself too thin. This is what is missing from my planner strategy – printing it off as I type! Thank you!!!!! Oh I’m so glad you’ll find this useful. I’ve been using the checklist myself for couple of months now and it’s really made a difference in how approach planning out my weeks. I hope you find it just as useful! Hi Alli, this is superb, printing it right away, I was busy these days, so missed reading your blog articles, I am so glad to find this.